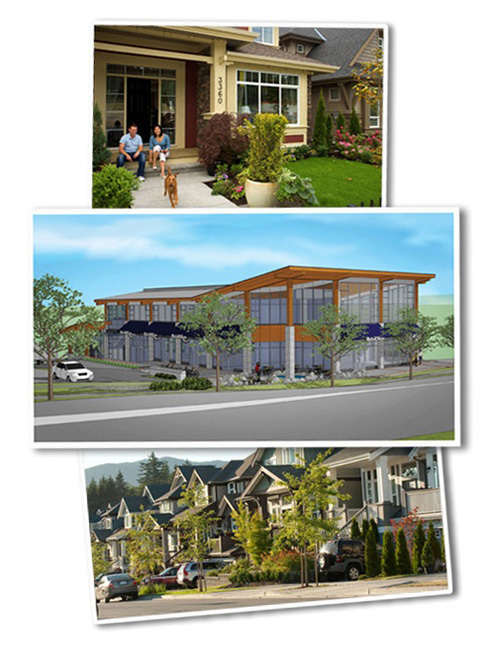 While new home development on Burke Mountain continues to move forward at a very fast pace, retail and commercial development is still in its very preliminary stages. There are plans for a future Village Centre at the eastern-most end of David Avenue in the Partington Creek neighbourhood, which will be the central commercial area for Burke Mountain. While the Burke Mountain Village Centre - Partington Creek Village - is still likely 5-10 years away, the only current retail development is happening at the corner of David Avenue and Coast Meridian Road. Meridian Crossing is located at the southeast corner of Coast Meridian Road and David Avenue, and it is designed with a modern architectural feel that compliments the natural setting of the Burke Mountain area. The two-level small shopping centre features a mix of dental, professional offices and ground floor retail. Tenants include 7-11, Subway, Hiraku Sushi, a dental office and CEFA Preschool. Meridian Corner broke ground in late 2013 on the northeast corner of Coast Meridian Road and David Avenue. The site of the former Foothills information centre is currently home to Shoppers Drug Mart, TD Bank, Foothills Medical Clinic and Johnston Meier Insurance.